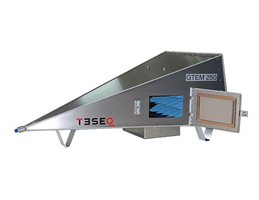 The GTEM cells are the frequency extended version of the traditional Transverse Electro Magnetic (TEM) cell. The GTEM cell is a tapered coaxial line which is terminated by a combination of resistors and RF absorbers to achieve a broadband match. This can be used for various applications like calibration of antennas/field probes, test and measuring of mobile phones and screening measuring of material. With GTEM cells you can perform emissions and immunity testing in a single, controllable shielded environment.